My SMaSH Mosaic IPA. First beer to start the evening. Then an Odell’s Fresh Grind IPA…. Wow! Then a Sierra Nevada Hop Hunter with distilled Hop oil. Gotta love a Texas Backyard Birthday! Then a nice slab of salmon with pesto butter! And what a great treat- the family searched far and wide and found 5 – six packs of Hopslam! I am in heaven. Gotta find a cold and secret place to store them. Thanks Lisa for a card that made me cry! It is not so bad to be two years beyond Medicare age! Maybe a Hopslam night cap????? Bottled on the 18th of February so I have waited the requisite 10 days before I popped the top on the first bottle….couldn’t wait any longer. One of the bottles was only 3/4 filled so it became the sacrificial lamb. Partially filled a “Back Pew” pint glass. Enjoyed my taste test while watching a very strange X-Files episode! Good color – actually seems to be a bit more amber than on bottling day. Pretty well carbonated and very nicely hopped. I was a bit spoiled with the Hopslam I recently found but….. this Homebrew, even though not a double IPA, has top notch hop flavors and aromas…….thank you “dry hopping”. I will definitely use fresh hops again! I may let it go a few more days to condition a little further but it is very, very drinkable right now! The Bakken Makes More Than Oil! 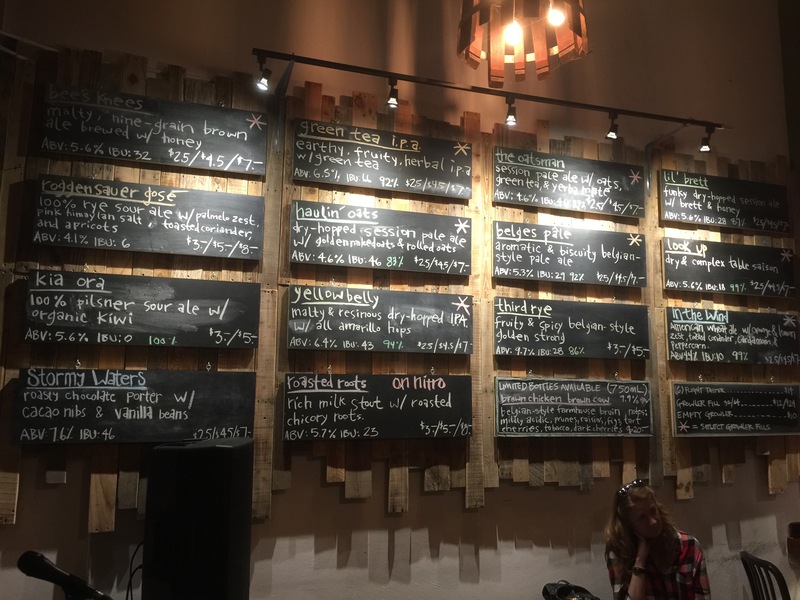 Stonehome Brewing Company in Watford City is cranking out some very good beers. After a late morning, early afternoon photo safari in the northern end of the Teddy Roosevelt National Park, I pulled into the Stonehome for a sampling. A few of my new friends in North Dakota. I worked up a thirst stalking them for their family portrait. Heartless is an easy drinking pale ale that even this IPA craving fool can enjoy. Kathy, lovely and sweet wife would really like this one. Central Perk, that’s right – Perk – Another pale ale, a little higher ABV with a touch of cold pressed coffee. Nicely hopped but not IPA strength. I really did enjoy this one! Latifrons, Down By The Beach – is an excellent pale ale, nicely hopped, aromatic and comes in at 35 IBU. Latifrons – an extinct predecessor of the modern day Bison that now roam the Teddy Roosevelt National Park. Maah Daah Hey – Red Rye IPA – my favorite of the four I selected. IBU up in the 50 range and an ABV of 6.3%. Yum! Stonehome donates to the Maah Daah Hey trail group for every keg sold. I could definitely put away a keg of this…..not by myself, I would invite a few select friends! Stonehome hasn’t been around long, established in 2016 by Watford City locals, they have an awesome brewery. As Arnold said; I’ll be back! 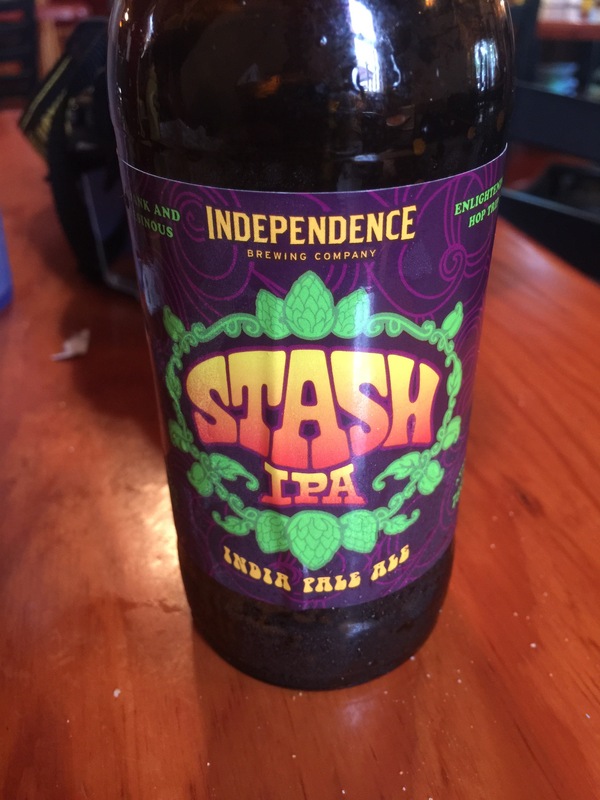 I gotta add something – I have a new favorite IPA! Made by Surly Brewing. Surly Wett, a wet hopped IPA using freshly harvested 2017 Mosaic hops. Absolutely stunning. It is a seasonal brew and once gone, it will only be a pleasant memory! I wonder what hop the Wett for 2018 will feature? I’m sure it will be good! 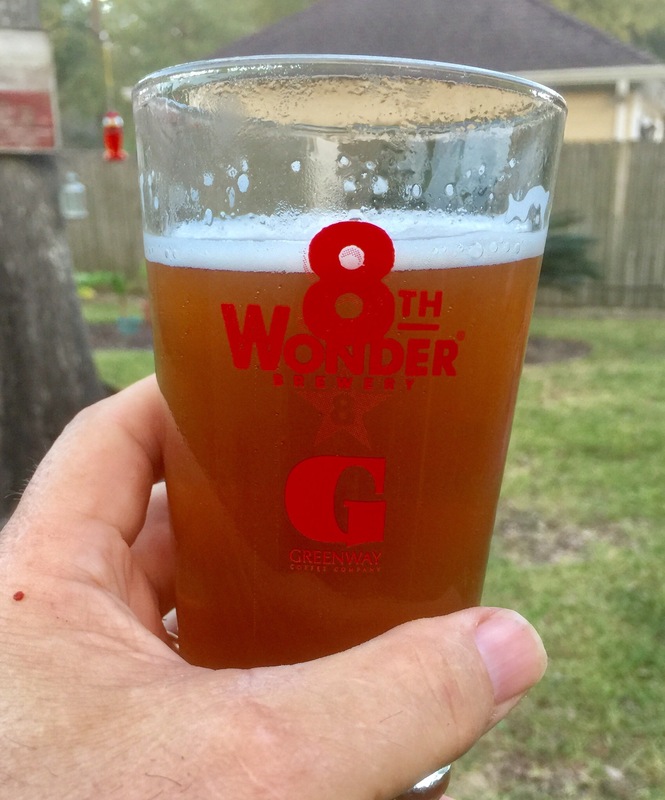 So, to celebrate, I am hoisting my Honey Blonde Ale, in a pint glass from 8th Wonder Brewery, a fine local brewery, toasting the well deserved 2017 World Series Houston Astros. Hip, hip hooray! Hip, hip, hooray! Ahhhhhh – refreshing and so satisfying- like the long awaited and well deserved World Series Champion Houston Astros. FYI, in the works – a Russian Imperial Stout to be brewed without collusion, a session IPA and single malt-single hop ale. I PROMISE! Just a quickie from Fredricksburg Texas. Very, very nice IPA from Austin, TX. Gotta find some more! That’s all for now folks…..gotta go and gotta brew……I am way behind! Gotta love California for a thing or two or three. Yesterday my bride and I drove from Bakersfield to Santa Barbara. It is my birthday weekend and she is intent on spoiling me…..I am always pretty spoiled by her, but this is extra special. I loaded up my camera bag and lenses and let her drive the windy route through Maricopa and over the mountains into Ojai. The sky was ugly and hazy and the wild flowers have not yet hit stride. Dang! I could rubber neck and not incurr her wrath!!!! She prefers to drive the windy roads – it solves her motion sickness issues. 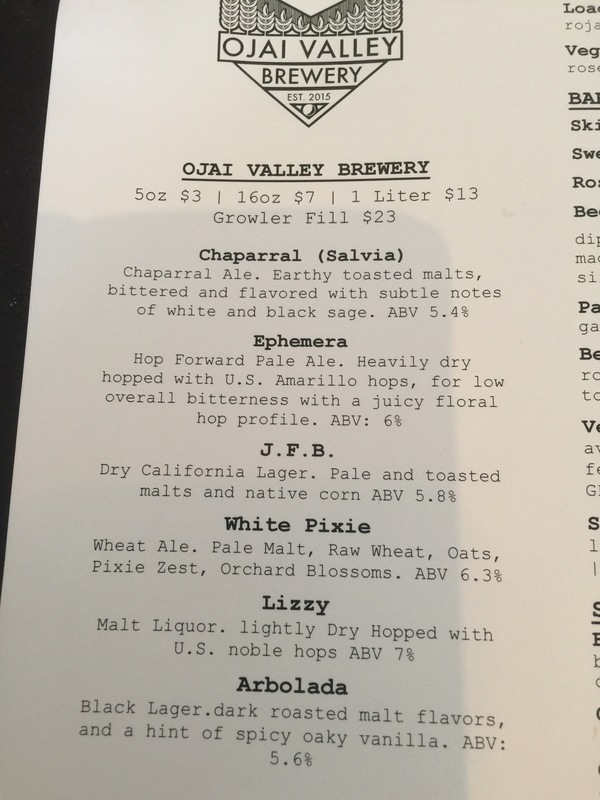 Ojai – Ojai Valley Brewery was first up. 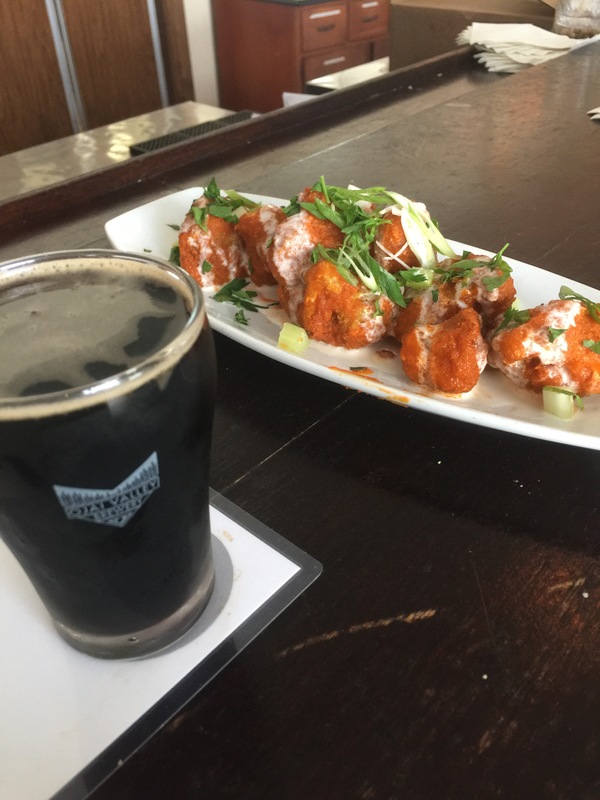 Nice selection of beers and we also found a great “small plate”, Buffalo Fried Cauliflower. It will be added to our recipe box. Kathy enjoyed the White Pixie and the Ephemera was my favorite of those I sampled. Very slow lazy service for a Friday afternoon but we were not in a hurry, “chill out dude” and enjoy the chauffeured drive. 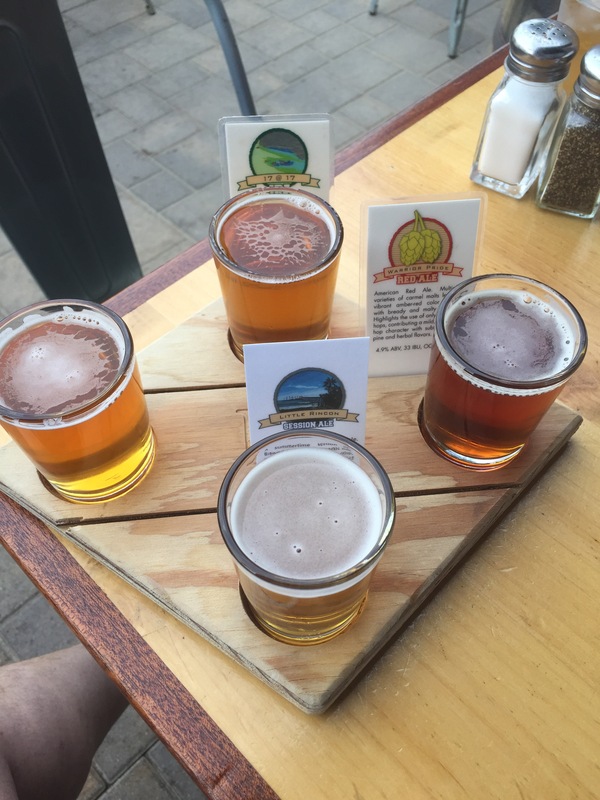 Carpentaria – Rincon Brewery, substantial food and good beer. We dropped our bags off at the condo and grabbed a seat outdoors on the street to watch life drift by. I went with a sampler and the Tri-tip sandwich. Kathy had her go to Blonde ale and the Cobb Salad. Fun place, good food(I love the lamb burger slider- next time!) and quality beers. We then wandered down the street to Brew lab….it is a small place, they brew in small batches and never repeat! I sent them some money last year for their crowd funded expansion. They fell short but I still got a shirt and a free beer. Last night a talented young musician entertained the crowd. 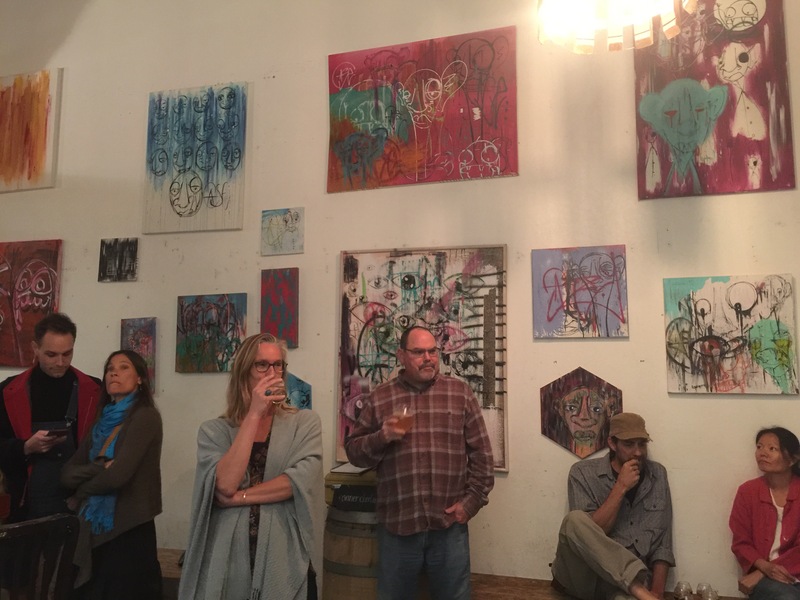 Interesting art work on the walls and I nice crowd. I had the Yellow Belly Ale and Kathy was in the role of designated driver, thank you Hun! Where shall I drink beer today? Such hard choices and so many options…..gotta love being and old guy, semi-retired and my “Goo” friend John back home feeding my bees…..thank you John!